Working one-on-one with students who are demonstrating a fragile sense of number are opportunities I greatly value. I always approach these times from an inquiry perspective, looking for clues to help me understand their struggles. Often they are demonstrating many strengths in some areas, but something is keeping them from moving forward with their math learning. Sometimes we refer to these children as students of mystery. Our learning as a result of working with them will positively impact others in the classroom. Recently I had an interesting experience with a Grade 3 student whom I will refer to her as Donna who is demonstrating a fragile sense of number. Yesterday she played a game called “Race to 1000” and it became apparent that she was having difficulties when working with numbers over 1000. The teacher asked me to play a game called, “Race to 500” with her. With this game you roll a dice and multiply the number by 10 and take that number of base ten blocks. On future turns you trade the tens in for a hundred when appropriate. The winner of the game is the one who reaches 500 first. Observation: Donna rolled a 4, looked up towards the ceiling as she tried to figure out 4 x 10. I told her that she did not have to know that right away, but could take 4 tens from our pile of base ten materials. She did this, counted them and the game began. We each took our turns and we traded when appropriate. We played the game until both of us had 5 hundreds in front of us, so I asked her how much we both had. I pointed to each hundred block and she counted 100, 200, 300, 400, 500, 600, 700, 800, 900, ten-hundred. I wrote the number out for her – 1000 and said, yes it is 10 hundreds and another way of saying it is one thousand. Instructional Decision: That observation led me to the following instructional move. I decided to play a game with her that we had taught at an after school math club that I knew she was familiar with called “What’s the Biggest Number?” When I’m working with students and trying to discover what their challenges are I always start at a place that I am sure they will experience success. From that point I begin to move forward slowly increasing the level of difficulty so that I can observe where they are starting to get stuck. With this game you draw horizontal lines on a piece of paper ____ ____. Then you roll a dice and decide what place to put the digit (tens or ones). The object is to try to make the biggest number. Then I had her read the number. We then moved on to 3 digit and then four digit numbers. The four digit number place was the one I was aiming for because I wanted her to gain a comfort with reading numbers in the thousands. We then started building these four digit numbers with the base ten blocks because I wanted her to understand the quantity she was working with. *Identifying patterns in the hundreds chart – Start by putting a number in the centre and find one more, one less, ten more and ten less. Donna had her own hundreds chart so I asked her to choose any number from that chart. After she chose eleven, I put it in the middle and asked her to fill in the other spaces without looking at the hundreds chart. I am observing her as she does this. She knew very easily that the number before is ten and the number after is twelve but it took some thinking to figure out the numbers ten less and ten more. We moved on to the number 31, then 62, then 87. Ten more did not seem to be a challenge for these, but going backwards was a little more difficult for her. Each time she completed a set of these, I had her check using the hundreds chart. She discovered a couple of times that she went back too far (by 20 instead of 10). I then decided to move to a number in the hundreds (120). (See photo) This proved to be challenging as she immediately put 1000 in the ten less space and 121 in the before number space. I told her we would leave this one for a minute and I moved to putting 20 in the centre. Without any difficulty she filled in all four spaces quickly. I then decided to have her build 20, 21, 10, and 30 with the base ten materials and we arranged them in the order that they would be on the hundreds chart. We then added a hundred block to each of these to make the numbers 120, 121, 119, 110 and 130. This highlights the importance of using visuals to identify the quantity that we are working with. 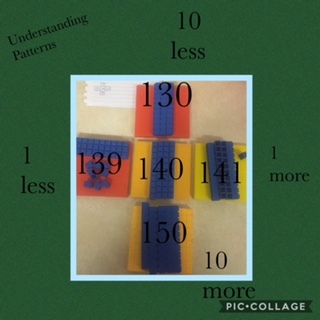 With this she was able to see why the pattern was the same as with 20 except for the hundred block. 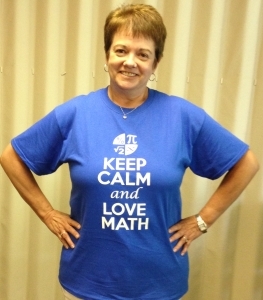 A student can memorize a pattern with smaller numbers, but a breakdown can occur when the numbers get bigger. Our time together was almost up so I gave her one more to do independently. I gave her the number 140 and asked her to build it with the base ten blocks, then build the numbers that needed to go into the other spaces – one before, one after, ten less and ten more. She did this without any difficulty. I know that in order for her to consolidate her learning she will require many more opportunities to work on this. For me this confirms and highlights the importance of using visuals and concrete materials to develop conceptual understanding of the relationships between quantity and patterns within our number system. Previous Previous post: Ants! Ants! Ants!